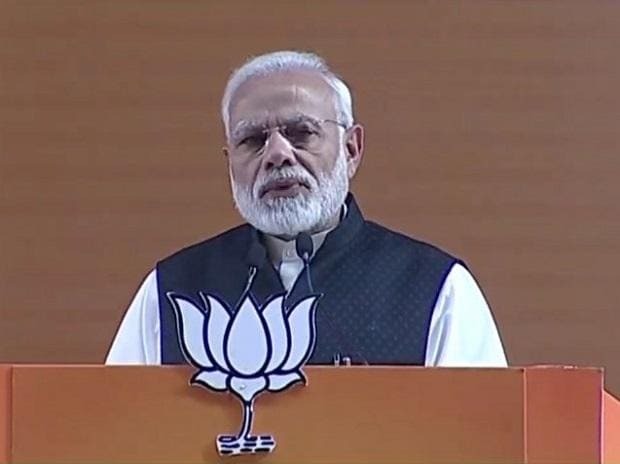 Dubbing the anti-BJP grand alliance as a "failed experiment", Prime Minister Narendra Modi said on Saturday the opposition parties are coming together as they want to form a 'majboor' (helpless) government to promote nepotism and corruption, whereas the BJP wants a strong dispensation for all-round development. Modi also attacked the Congress over the Ram Temple issue, saying it doesn't want a solution to the Ayodhya dispute and is creating hurdles through its lawyers. Addressing the BJP's National Convention, the prime minister said the parties that were formed primarily to oppose the Congress and its culture have now joined hands with it. "We want a strong government so that we can put an end to corruption. These days there is a failed experiment taking place in the country which is known as the grand alliance. They have all gathered together to make a helpless government. They don't want a strong government which will lead to shut down of their shops," Modi said. His comments come after the BSP-Samajwadi Party announced their alliance in the politically crucial Uttar Pradesh, in which the BJP had won maximum seats in the 2014 Lok Sabha polls. "They want a helpless government so that they can indulge in corruption. We want a strong government so that we can put an end to corruption. They want a helpless government so that they can do good for their relatives. We want a strong government so that we can usher development for everyone (sabka saath, sabka vikas)," he said. He also slammed the governments of Andhra Pradesh, West Bengal, Chhattisgarh for withdrawing general consent to the CBI in their respective state and asked why they were afraid and what irregularities they have done. At the same time, he mentioned about his experiences with the central agencies during the UPA rule. "Despite being harassed by the UPA government for years when I was Gujarat CM, we didn't ban entry of CBI in state," he said. The prime minister said 10-per cent reservation in education and government jobs for the youth from economically weaker sections will enhance the confidence of 'New India' and asserted that the new arrangement will not encroach upon anyone's rights. Modi said that for the first time in the country's history, there has not been any charge of corruption against a government. The BJP rule has proved that the country can be run without corruption, he added. He said earlier governments saw farmers (annadata) as only 'matdata' (voters), while his government was constantly trying to address challenges faced by them. "We are working day and night to double farmers' income by 2022," he said.